In 2000, a month after the birth of my first, I had no idea what I was doing. My sister-in-law Kim, who had - at that time - a three-year-old and a one-year-old, seemed a seasoned professional. She had already seen through to the other side of potty training, first words, first steps. Kim introduced me to Dr. Denmark. Both of her children had their first well-baby visits with Dr. Denmark, and she recommended I do the same. At the time, Leila was 101 years old. A practicing pediatrician, working out of her office, next to her home - in Alpharetta. Far outside the perimeter (OTP, as we say), on a sleepy street, with a giant oak in the yard. You arrived at the office and entered, according to your need: sick children, well babies. Well babies got first attention. No appointments. $15/visit, pay cash at the desk. One person worked for her, as I recall. 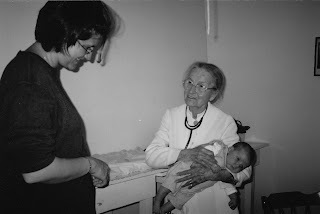 Dr. Denmark took her role very seriously: showing generations of mothers how to trust themselves. She believed in the football hold for soothing fussy children. She taught that crying toughened lungs, and that coughs were to be resolved and not shut up. She felt cow's milk was dangerous and mother's milk was best. She spent thirty minutes talking to me and my healthy baby - reassuring, and doling out time-honored wisdom. I towered over her, and she seemed the pillar of strength. I wanted to impress her. I wanted to appear capable. To win her approval. She said, at the time, that we should all read less about raising children and spend more time raising them. She said to have clear boundaries, that babies didn't want to roam free - that children want limits. She felt strongly that you should never raise your voice or hand to your child, but that you should be attentive enough to not need to do either. She felt we should all, new parents, quit looking to books to tell us what to do and find quiet spaces to figure out our instincts, and follow them. "A cow knows what to do with a calf - certainly you can figure out what to do with your baby." She was affirming, comforting, and direct. And she loved every minute of what she was doing. My same son has been sick this week with a mysterious and somewhat gruesome virus that has left his lips, inside his mouth, and throat riddled with sores. He has had a fever for seven days. My primary care physician scolded me for taking him to urgent care. The urgent care physician gave him antibiotics that aren't doing anything discernible. It appears to be running its course, and he is on the mend. And out-of-pocket, this journey (and we have great insurance) has cost in excess of $200. The doctors poked a little, prodded some. Gave some advice. The feeling was of work - their jobs, our efforts to get there. Insurance cards examined and processed. I was tired just going, and my son felt no more soothed by the words of doctors that went around him. My son is sick. Our healthcare system is screwed up. And I miss Dr. Denmark - who I hear is still alive, in Athens. At 112. So I was thinking about her today. Talking about her, to my friend Kelly, who said "I remember her! My Dad loves her! You should write about her." And then the day took off. And all this work stuff happened. Work opportunities of the kind of work I did before. Pre-kids, pre-marriage. Event stuff where work and play all blurred. And being in the thick of it was fun.
" Anything on earth you want to do is play. Anything on earth you have to do is work. Play will never kill you, work will. I never worked a day in my life." - Dr. Leila Denmark, who retired at 103, the world's longest-practicing pediatrician. Of course, this all assumes Sebastian will be fine by next week. He will be. He will be. He will be and it will be good for all of you and you have support in Athens and all over. Can I moniter hair cuts? Absolutely. And they all need them. Another reason to leave. A little click in my brain - just a quick mention - that my mom mentioned something to me about sores around and in her mouth. This happened to her, not somebody else, not something she heard about somewhere. And she is/was an R.N., so she's spent time as a health care professional. All that to say, there's no judgement in what I'm about to ask you. But have you considered a vitamin deficiency? Because the sores my mom had, and this was just about a year ago, turned out to be due to a lack of vitamin B. She was given antibiotics at first, and they did nothing to help. Then the vitamin B treatment, et voila. All better now. It's worth a look. Definitely worth a look - doctors rarely bring up such things. Lysine, too, needs to fold into his daily vitamin intake.